plays salon music the way it was played in the second half of the nineteenth and the beginning of the twentieth century. It was performed in the more upper class establishments and in salons of big hotels, castles and cruise ships. To describe salon music one must think of stylish, light classic and melodious easy to listen to music. Characteristic are the timeless melodies that move the listener and stay in one's memory. The music of Salontrio Café Noir makes you think of a time gone by, the time of the diligence and the velocipede. A piece of history that we now think back on with a certain nostalgic feeling. Café Noir takes you into this with music that can be moving and romantic, as well as sparkling, but always energetic. 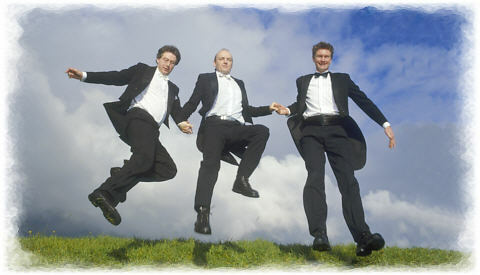 comprises of Adriaan Stoet (violin), Arjan van der Boom (cello) and Jan Groot (piano). They have been performing together in the same set-up for the past ten years. With this much experience the trio has developed a solid ensemble of which the members can follow each other blindly. is a visiting card of Salontrio Café Noir, with information about the repertoire, the musicians and a possibility for online bookings. Added to this you can listen to fragments of our cd's.